"Pianist Tommy Flanagan is a brilliant, highly individual musician who has been involved in some of the most important recording sessions of the post-bop era." Born in Detroit, Tommy Flanagan began studying clarinet at the age of six, and took up piano when he was 11. In his early years he performed professionally in the Detroit area with Milt Jackson, Thad Jones, Elvin Jones, and others, playing in a style influenced by Art Tatum, Teddy Wilson, Hank Jones and Bud Powell. After moving to New York in 1956 he occasionally substituted for Powell at Birdland, and was deeply affected by the music of Charlie Parker. In the late 1950s and early 1960s he worked as a freelance, and played with Oscar Pettiford, J.J. Johnson (1956-58), Miles Davis, Harry Edison, and Coleman Hawkins, and appeared as a sideman on recording dates led by Kenny Burrell (Introducing Kenny Burrell, Blue Note), John Coltrane (Giant Steps, Atlantic), Booker Ervin (The Song Book, Prestige), Gene Ammons (Boss Tenor, Prestige), and Sonny Rollins (Saxophone Colossus, Prestige). 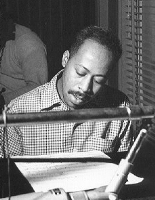 Flanagan is, perhaps, best known as pianist and music director for Ella Fitzgerald, with whom he worked for a number of years (1956, 1963-65, 1968-78). He also served as music director for Tony Bennett (1966). From 1978, however, having tired of accompanying singers, he began working with small instrumental ensembles. His tasteful skills as an accompanist have sometimes overshadowed his graceful but authoritative solo style. A master of bop, a poetic interpreter of popular tines, and an eloquent spokesman for the music of Duke Ellington and Billy Strayhorn, Flanagan was one of the jazz world's most sought-after pianists. A selected discography of Tommy Flanagan albums. Tommy Flanagan Trio Overseas, 1957, Prestige. Beyond the Bluebird, 1990, Timeless. Lady Be Good, 1993, Verve. Sunset & Mockingbird, 1998, Blue Note.